For The Gourmet is a Chef-operated company founded on the premise that outstanding foods begins with outstanding ingredients. For the Gourmet supplies chefs and home foodies all over the country with access to high-quality ingredients that might not otherwise be available in all areas. In that vein, For The Gourmet offers the finest ingredients and kitchen accessories available on a single site. You can find top notch meats, cheeses, cookware and more all in once place. They offer a variety of fresh produce, proteins, gourmet prepared foods, and specialty ingredients. They also recognize the growing need for quality products for those on gluten-free and specialty diets and a have a category of delicious foods devoted to just those needs. You'll find quality brands like Schar, euforia, The Cravings Place, and more! What a valuable service to those people whose bodies require often difficult-to-find foods and ingredients! 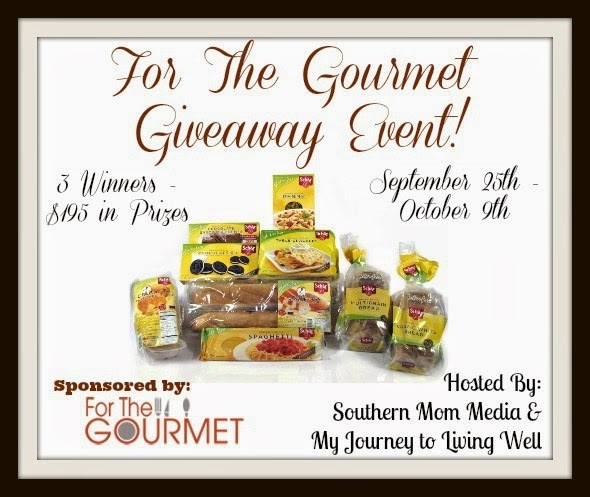 THREE lucky winners will each a receive an amazing Gluten-Free Variety Pack by Schar! To enter, use the Rafflecopter form below. (It may take a moment to load.) This giveaway is open to US Residents ages 18+ ONLY. Void where prohibited. Giveaway ends 10/9/13 at midnight EST. Disclosure Statement: Why We Love Green received no compensation for this post and is not responsible for prize drawing, shipment, or fulfillment. This post contains affiliate links. Any questions should be directed to mendyboyd@yahoo.com.